This entry was posted in "Four legs good", Single Note Exploration and tagged Antica Farmacista, Daphne Flower. Bookmark the permalink. That perfume sounds gorgeous! I am not acquainted with the Daphne flower in real life, and didn’t care for the note in the only perfume I ever smelt that purported to have it in. Can’t recall the name now, but it was a sort of celeb scent – maybe even linked to Daphne Guinness??? I tried a couple before – not even close. So this experience was even more uplifting than it would have been otherwise: finding a nice rose or vanilla perfume is great but there are dozens of other great renditions for those notes. With Daphne it was a great surprise. YAY!!! I remember your story and am so happy it eventually had a happy ending. Love to think of you laughing when you tried it. What a great moment. Good work hajusuuri! I was surprised myself! I remember thinking at the time: “that’s what they mean when they say that!” I’ve never had that reaction before. But it was so unexpected that it caught me completely off guard. I’ve always loved Daphne flowers too and can be found sniffing the air like a bloodhound when tracking down a hidden shrub! You’ve made me crave this now ….. Since it’s the U.S. brand, I doubt you can get it where you live. But I’m so impressed that you’re familiar with this plant that my sample (that I don’t need any longer since I’ve got a 15 ml bottle) is yours. I’ll check when my perfume mule has the next trip, so we risk only your internal PO hindering. Now I want to rush to a store and sniff this! I hope you’ll find it. I think other products in the line, not just perfume, might be also very pleasing. Such an interesting place to find the scent. I have always liked their home scents but never tried and perfumes, in fact, I can’t say I knew they had them. I have never come across a daphne flower but now you have me curious. Maybe they don’t grow in hot Texas? Anyway, glad you met your match! Daphne is so not interesting visually as a flower that I would have never known about it if it weren’t for that wonderful scent that led me to it. Now it is one of my most favorite blossom aromas: it is painfully beautiful, something that you want to capture and keep with you. 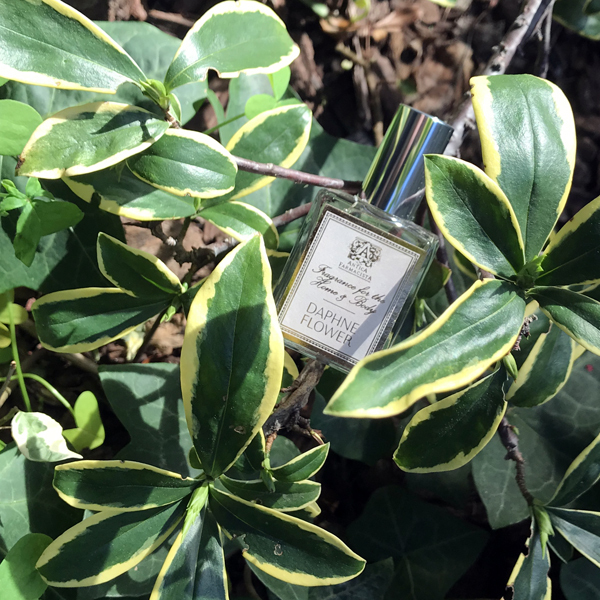 There’s only one other scent that has a similar effect on me – linden blossom. Well now I really have to try it! I’ll look for it next time I’m in a store that carries that line. Woo hoo! I have to search for my other sample! I got the samples when the Daphne Flower home fragrance was launched at Bergdorfs and I believe it was exclusive to BG, at least at that time. It was on the 7th floor with candles, home goods, restaurant and children’s wear. I’ve used the Antica Farmacista reed diffusers for years, always the Vaniglia, Bourbon and Mandarino in the half bath. I’m so glad that you got it and shared with me. I plan to look into their other scents as I’m looking for a replacement for my current diffuser. 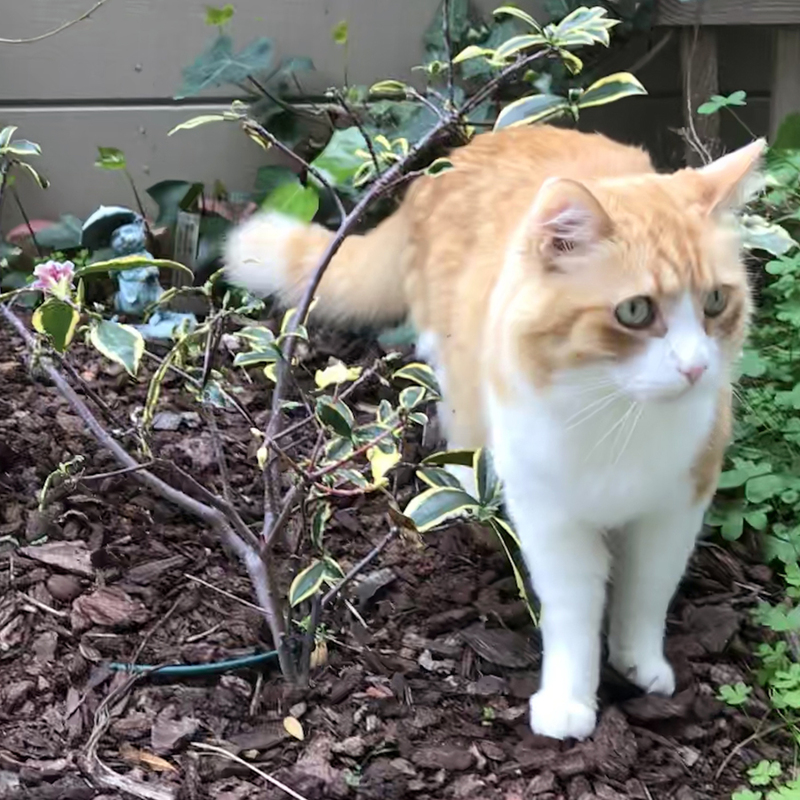 Rusty is a little intimidated by the size of your cats (he overheard when I was telling my vSO about them), but promptly forgot about it as soon as I offered him a treat in your name. If you ever come across Daphne odora in February when it blooms, you’ll probably know that you’re smelling that flower: when I didn’t know what it was and tried looking for it, I smelled a dozen of other shrubs – and none of them smelled even close to Daphne, so unlike it happens with different fruit tree blossoms when each one is great but different, this plant stands out from others that look similar. It’s too bad I cannot send you the flowers themselves (and not only because it didn’t bloom for me this year :) ), but you’ll get a sample of this perfume with the next package. I might even go for a bottle of what they call “perfume” because their response to my e-mail inquiry was that what I bought was a room spray usable on skin (hence “home and body”) but what they sell now is an actual perfume. 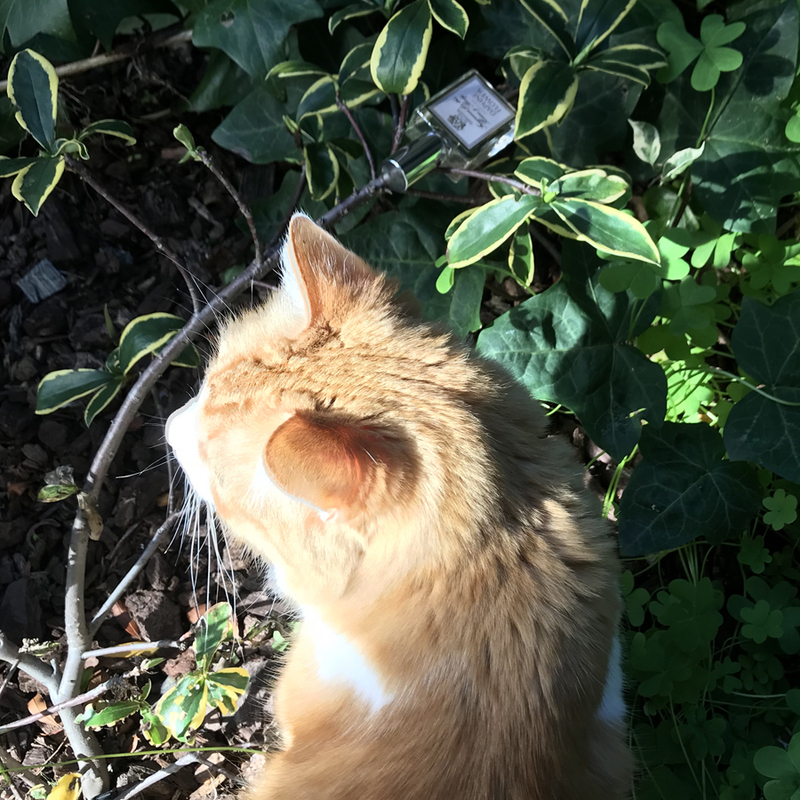 Oh, yeah, Rusty would agree: he loves hunting – spiders, flies and sun-rays. Perfumes, even the best ones, rarely smell identical to flowers, so it’s probably better to have complex perfumes that do not even try to resemble any one specific flower. It sounds like a lovely fragrance, Undina. Hope your plant delivers that bloom.